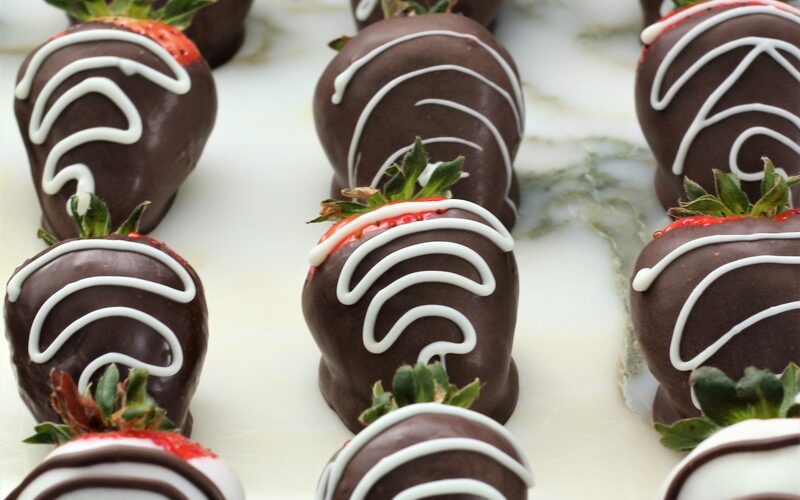 Chocolate covered strawberries are very popular. I had no idea how much everyone loves chocolate covered strawberries until I made some the other day for my daughter’s friend’s bridal shower! They told me that they were inviting 50 people. So I made 75 chocolate covered strawberries. Well, little did I know that within the first hour of the 2 hour shower, all of the strawberries would be gone. Holy cow! I am pretty sure that people were taking more than 1 each. Some of the chocolate covered strawberries were pretty big too. Some of them were a little smaller, but for whatever it is worth, they were very popular. Then there is my grand daughter. Ha ha! My daughter blessed her new baby on Sunday and so I decided to make more strawberries and decided to decorate them to look like carrots since Easter is just around the corner. We had a luncheon after the blessing. After most of the people had left, my daughter said to me, “where is little miss getting all of these strawberries”. Then we figured out that she was getting them off of the plate and eating the chocolate off of the outside! She is a little character, and when I went over to the table, all of the strawberries were gone!!! Her mother wondered where she was getting all of these strawberries that she was bringing to her. So if you are wondering? Yes, 2 year olds love orange candy melts! I was very surprised at how quickly these dipped strawberries came together. It took me about an hour to dip all of the 75 strawberries and drizzle them with chocolate. Also the reason that I have a couple of white dipped strawberries is because I had extra white chips. So I dipped a couple of strawberries in the white chocolate and then drizzled it with some of the extra darker chocolate that I had left over. However, the darker strawberries got eaten up first. So no matter what you do, have a wonderful Easter and remember that spending time reflecting on our Savior is the most important part of Easter. And I feel the second most important part is spending time with loved ones. Get together and have fun, and do not worry about the small stuff. Oh ya, that is one other thing my cute daughter did; she decorated a cake that she wanted to do for the baby blessing dinner, but she didn’t get it finished until it was over. Well her cute little daughter was acting like her grandma use to, and she decided to decorate the cake better than her mom. She ate some of the frosting, and then ate some more, and some more, and ya that was quite the cake after her 2 year old got through with it. Like my mom use to say, oh well it gets mixed up in your stomach. Have a wonderful Easter! 1- I grabbed the leaves and dipped the strawberries in the chocolate. 2- If the strawberry didn’t have very many leaves, I poked the top with a toothpick and dipped it in the chocolate that way. 3- I would also tip the pan of chocolate so that the chocolate was thicker on one side making it easier to dip the strawberries. 4- Make sure that the main color of chocolate is set up before you garnish the strawberries with the second color of chocolate. 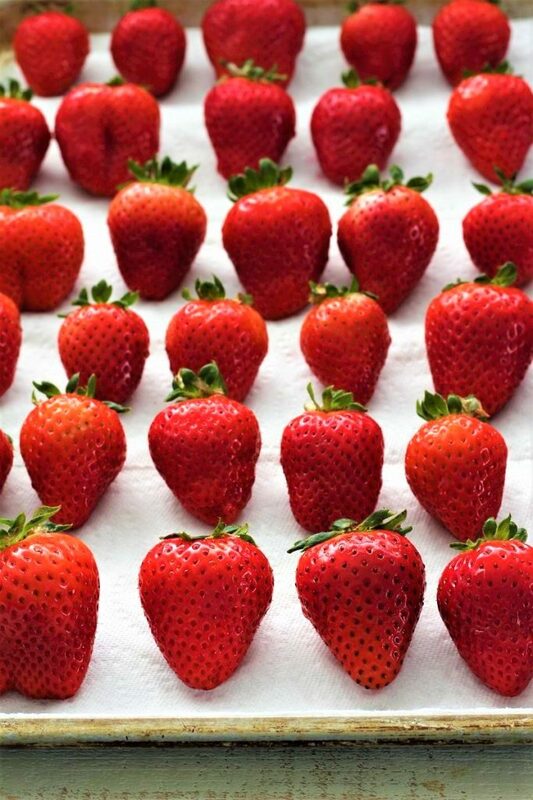 Wash the strawberries and make sure that they are completely dry. (So that the chocolate will stick). Place a large piece of waxed paper on the counter top. Microwave for up to 6 minutes at power level 5 in 2 minute increments. If it is not melted by 6 minutes, repeat at power level 5 stirring every 30 minutes. Stir and make sure that all of the chocolate is melted. 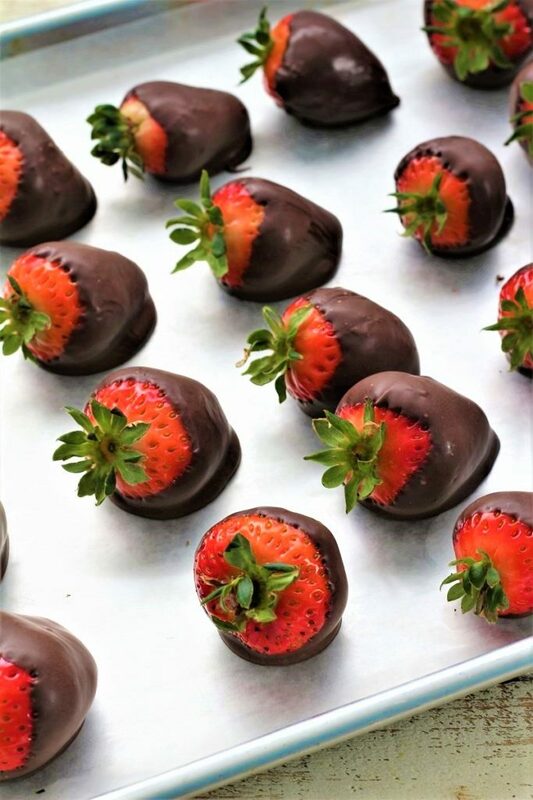 Take a strawberry, pull all of the green leaves to the top and carefully dip each strawberry until it is covered in chocolate. Then if you want a different color to drizzle over the strawberries, get another bowl and melt the other color. Get a glass and place a small baggy in a cup, making sure that one of the corners is pointed down in the glass. Then snip the very tip of the bag off with scissors and drizzle the white or brown chocolate over the dipped strawberries. Allow the strawberries to dry. Or you can place the wax paper on a cookie sheet and place the strawberries in the fridge until the chocolate sets up. 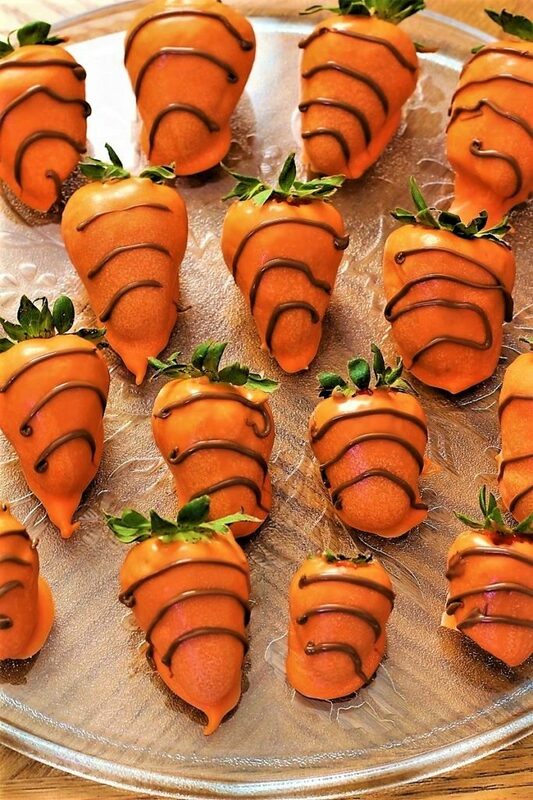 If you want to make the one that look like carrots use orange chocolate and drizzle with chocolate.